The NYPD on Monday released footage from a body camera worn by the officer who shot and wounded a knife-wielding man last month. 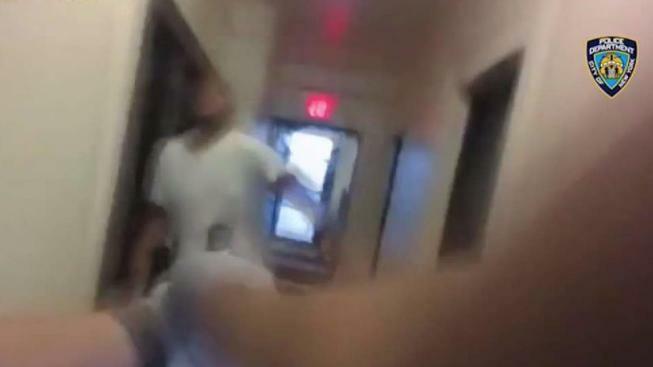 The footage captured from inside an apartment building on West 143rd Street and Riverside Drive on Oct. 22 shows officers getting off the elevator on the sixth floor of the building after getting a call about an emotionally disturbed man who was attempting suicide. When they knocked on the man's door, video shows him open the door and step back with knives in his hands. Police shout "Put the knife down!" repeatedly as the man approaches them. The officer wearing the camera then draws his gun as he backs back into the hallway. The man -- identified as Paris Cummings -- followed after. The officer then shouts "put the knife down" one final time before firing at Cummings. The 27-year-old was hit in the leg, according to police, and survived the injury. Authorities in October said Cummings had already stabbed himself once before he was shot. Afterward, they said officers performed first aid and called for an ambulance, police said. Cummings was indicted afterward on attempted murder charges, according to the Daily News.